There has been little to update about since my move to London last year. Admittedly, it’s been another uphill climb to meet new casting directors and get seen for the projects I’m right for, but it finally feels like I’m gaining momentum and hopefully this will be the first of many happy announcements in the next year. 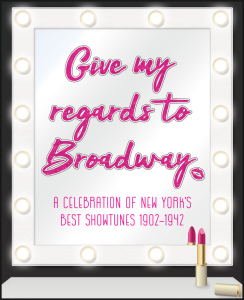 I’m thrilled to announce I’ll be performing in a brand new musical revue, Give My Regards to Broadway this July and August at Upstairs at the Gatehouse in Highgate, North London. The show, which is being produced by Jospeh Hodges, will be directed by Harry Blumenau with choreography by Chris Whittaker and music direction by Ashley Jacobs. Joining me in the cast are Ben Lancaster, Albert Linsdell and Thea Butler. We’ll be bringing you all the greatest hits from the golden era of Broadway, including classics from Cole Porter, George Gershwin, Jerome Kern, Harold Arlen, and Irving Berlin. and buy your tickets for the show on the Gathehouse Theatre website! One Response to First London gig!